Writing about November 1, 1997, you’d recall that I said I didn’t see anything spectacular about that day more than the fact that it was my first day in FGC Ikirun; however, the activities of my second day in Ikirun were remarkable, I knew it was a day I would remember for a while. The activities of that day opened up my eyes to what my stay in the school would look like. In my mind, I was going to a Federal school where I would be under the tutelage of highly qualified teachers, and I got that. I also got what I didn’t bargain for, in Ikirun our lives were made miserable. Living in Ikirun was almost like what Thomas Hobbes described as living in the state of nature. As new students, we had to queue like Oliver Twists to get food and we ate standing; we also had makeshift classrooms. In short, there was no structure on ground to receive us. We were told that our hostel was actually a girls’ hostel the year before. Yes, girls’ hostel the year before and now a boys’ hostel, that was the nature of FGC Ikirun, the purposes of buildings kept changing. Sometimes, class rooms were converted into hostels, laboratories converted to hostels etc. You could never tell what your hostel this year would be used for next year. Let’s begin from the morning of 2nd November. I can’t remember how early the day started but I know it started pretty early. It was a Sunday, so we had to do our dirty chores before we appeared before God in our white outfits. It was a day we were about to be introduced to some of the eminent dramatis personae of our sojourn in Ikirun. I’m not sure we were summoned with the “last boy” call, it was our first morning in the school, we would learn that in the coming days. But I remember we stood in front of our hostel and we were addressed by Farouk Sheji. Now, that’s a name! And that was one helluva senior. Let’s make this look real, we called him senior Farouk. He was dark in complexion and, I think, from the north. He was in blue house, a member of the first set meaning that he was in S.S 1. I’m not sure whether to say he was tall. We were very small then and many of the seniors looked tall to us. If his height was contentious, his reputation was not. He was tough, one of the toughest in Ikirun; mind you, I’m trying to avoid the use of the word wicked. He was in charge of our room, the hostel where the yellow and blue house boys were. That Sunday morning, under the supervision of Mr. Kolade and senior Farouk we were made to do an unforgettable task – we were made to clean out the latrine toilet behind our hostel and that’s the reason I never forgot that day. It was unbelievable that our resumption was delayed by two months because the school was making arrangements to accommodate us, but that the arrangement did not include cleaning the toilet behind our hostel. And to think that we had to carry out such a task just a day after our resumption! Fresh boys from the cities. It was a pointer to the kind of life we would have in Ikirun. You see, the kind of sanitation we did that day is better left to imagination. The sight was horrible. The toilet was a gallery of pit latrines. I wasn’t new to pit latrines because the first six years of my life was spent outside Lagos, but my Lagos life had made me think the whole world had done away with pit latrines. My sympathy was with those who were seeing what a pit latrine looked like for the first time in their lives. Worse still, this wasn’t a well maintained toilet, it was one used by students who abhorred the sight of it, students who preferred to litter the open space that surrounded the toilet rooms. And the faeces we cleaned out had been under the rain and sun for a while. As nauseating as the sight was, we were made to do a thorough job with our cutlasses and hoes under the watchful eyes and threatening strikes of Mr. Kolade and senior Farouk. After we were done with our sanitation work, we went back to our hostel to prepare for the day. In my mind, I just wished the day was over, but it wasn’t. We still had more shocking surprises ahead of us. Hahahahah. This is hilarious. I can never forget that experience. This is an interesting piece Mr. Alade. I will not allow my kids to go through this type of situation. They deserve better. 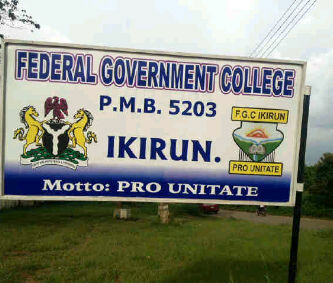 Wow, so much for the first morning of your stay at Ikirun. Hmnnn, memories. I must have had a lucky first morning though, if I could remember well, I had escaped from my hostel to green house as soon as possible that morning, and didn’t have to do any chore. Nice one bro, we are following. Good but tough old days. Well done Seun. Wow this is also a similar experience I had in NNSS abeokuta. Life of a boarder. what a nice experience, u remind me of my days in ikirun. pro unitate hmmmmm. Great Great our students, great great our teachers great great our almamata.